Every self-help book tells us to "be present," but few succeed in showing us how. With this beautiful book, author and artist Christina Rosalie leads readers to discover how the small and seemingly mundane aspects of daily life can through a shift in fo. Christina Rosalie has been writing under the mentorship of Pam Houston since 2008. Her essays and short stories have won awards and been featured in print and online. Her blog, My Topography: The Shape Of Daily Life (http: //mytopography.com) was the Best of Blogs "Best Creative Blog" winner in 2005, with a loyal and expanding audience of between 10,000 and 15,000 hits per day. A Field Guide To Now was successfully funded with more than $10,000 as a project on Kickstarter, and has a supportive following of backers who are awaiting their rewards in the form of chapter sneak peaks and postcards. Release of these will be timed to leverage the launch of the book. She is savvy to and active in the wide community of social media, where she has been interviewed about this book project by Susannah Conway, Beth Nichols, Liz Lamoreux, and Rachelle Mee-Chapman. The project has also been featured on Crescendoh, Wishstudio, Gypsy Girls Guide, and Boho Girl. She is developing a Field Guide To Now e-course and workshop (to be taught online and at Squam Arts Workshops in New Hampshire after the book's release), as well as an interactive Field Guide To Now website featuring a creative interview series and weekly reader contributions. She lives with her family in Vermont. – Katherine Malmo, author of Who in This Room: The Realities of Cancer, Fish, and Demolition. “No one talks about the moments in between,” and yet Christina Rosalie does. Reminiscent of Annie Dillard, Rosalie shows us how the unexpected details of daily life – a weasel destroying the hen house, a praying mantis climbing the pepper mill – allow us to understand that “the present tense is at once much bigger and messier and also smaller and more precise” than we can imagine. Interrupted sleep, fledgling dreams, clambering children, and several cups of coffee later, we learn, as she has, that, “It’s easy to look at what’s achievable in a day and come up short. 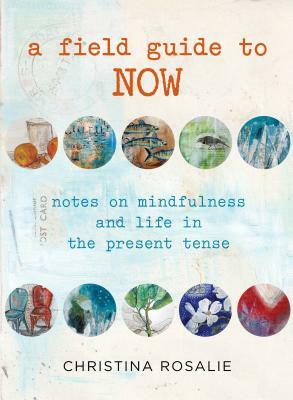 But it’s just as easy to underestimate what you can accomplish in a year.” Beautifully written and illustrated, A Field Guide to Now is just that, a guide to living in the present – one I plan to carry with me and return to often.